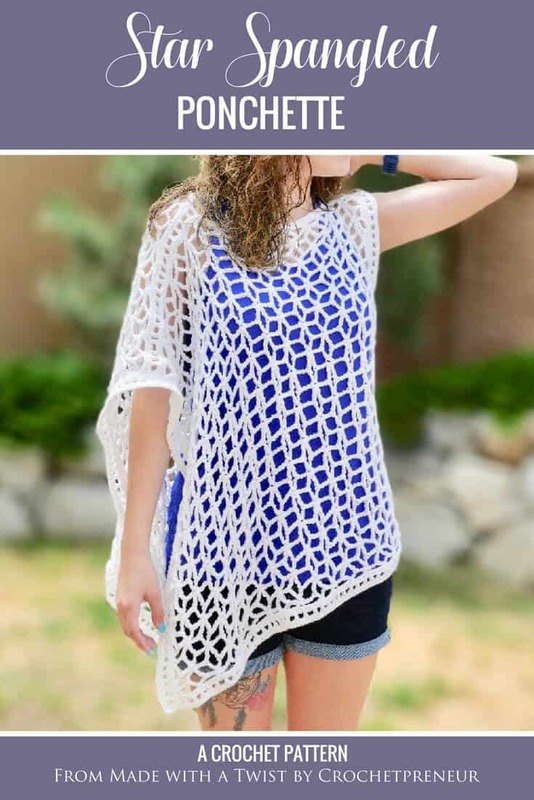 The Star-Spangled Ponchette is an asymmetrical summer poncho crochet pattern that you are going to love to make and, even more so, love to wear. I started designing this pattern while on a camping trip with my husband in Santa Fe, NM. In the evening, after the campfire had been extinguished and the coyotes were howling in the not-so-distance (is that a word? ), we’d stare up the stars for what seemed like hours and have precious conversations in hushed tones…it was all so breathtaking. If you’ve never seen the stars from the middle of the desert, I encourage you to add it to your bucket list. On that trip, when the days were just too hot to leave the camper, I sketched out this top and began playing with the stitches in order to get the star shapes I wanted. This has probably been my most challenging pattern to write, but I just love the finished product….the way the stars align and the poncho drapes over the arm are just elegant and graceful and feminine. I originally designed the piece to be a layered top for summer, but it can easily be worn as a beach coverup or poolside poncho, too. Dress it up or dress it down…whatever you please. That’s the kind of fashion accessories I love! Adorned with a lacy star motif, this summer top has a boat neck, cap sleeve detail, and asymmetrical poncho drape. The design is fully reversible so you can wear the drape on whichever arm is most comfortable. Personally, I prefer to wear the drape on my dominant arm so that it sways and moves as I do. If you are a lover of fashion that’s unique and not off-the-shelf-mundane, you’re going to love wearing this ponchette…it’s like the adult version of the twirly dress – which is great because you get that flowy, feminine feeling without the questioning stares that come when “they” say you’re too old to twirl. Instead, when they see you in your Star Spangled Ponchette, they’ll just remark at how great you look! One sleeve is a simple cap sleeve design and the other is worn over the arm like a poncho. The asymmetrical poncho design is meant to fit loosely and drape nicely. I know you’re going to love making the Star-Spangled Ponchette and I so look forward to seeing your finished product. Create a project on Ravelry for your unique creation and link it to the Star Spangled Ponchette pattern. Follow me on Instagram and share your photos. Be sure to tag @thecrochetpreneur and use the hashtag #starspangledponchette and #madewithatwisters. Floaty tops for summer are the best, this is a lovely pattern. Beautiful poncho! It was listed in the Linky Ladies as a free pattern. I don’t see the directions within this blog post. I signed up for the newsletters and look forward to crocheting some of your beautiful designs!